Ulrich Ostergaard in action for Panthers. Panthers captain Ulrich Ostergaard can’t wait to stage his special day at a special place. The curtain goes up on the new season when the Danish ace holds his ‘10 Year Spectacular’ at the East of England Showground on Sunday (2pm). The star-studded meeting, which features a guest appearance from Ostergaard’s hero Hans Nielsen, is reward for more than a decade of fine service to the sport on these shores. His day in the spotlight actually arrives at the start of his 14th consecutive season in British speedway. He has represented 11 clubs in that time, but his finest moments have arrived in the red and black of Panthers. Ostergaard was part of the famous Elite League title-winning team of 2006 and also captured individual success last summer when lifting the Premier League Riders’ Championship. He said: “I’ve always regarded Peterborough as my home and it is great to be able to start the new season with such a good meeting. “I’m really proud that so many top riders have agreed to ride for me and hopefully it will excite the fans as much as it excites me. “I’ve been lucky to have ridden for some really good clubs and I’ve enjoyed almost every minute of my career in the UK. Hopefully I still have some good years ahead of me. “I’m 35 next month, but I still feel young when I see guys like Greg Hancock, Peter Karlsson and Magnus Zetterstrom still going strong in their mid-40s. “But then I look at the Peterborough team and the fact I’m the only guy over 30 and it makes me feel old. “Hopefully I can use my experience to help the younger lads progress and make sure we have a good season. “I really think we could have won the league last year had it not been for all the bad injuries. “I love the look of our team for this season and hopefully we can challenge for the title again. Ostergaard was handed his British debut by Eastbourne towards the end of the 2003 season and did enough to retain his spot the following year. He then dropped into the second tier with Isle of Wight before being handed a spot in the Panthers team that roared to Grand Final glory in unforgettable fashion in 2006. 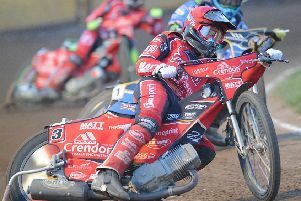 Ostergaard added: “I had ridden in the Premier League the previous year, but had a couple of meetings in the Elite League for Swindon at the end of that season and they made me fancy another crack at it. “I can remember Trevor Swales getting in touch during the winter and offering me a team spot for 2006. “I jumped at the chance because I already liked the Peterborough track from a couple of guest bookings. “It was fantastic to be part of such a great team even if my own season didn’t always go that well. “I started off scoring lots of points, but I got put into the fence down at Poole and it took a long time for my ribs to heal. “I never quite got my form back, but I am thankful that Trevor stood by me because I was sure the promoter, Colin Horton, wanted me sacked. Title-winning captain Hans Andersen, fellow Dane Niels Kristian Iversen and Polish ace Piotr Swiderski are the other members of the class of ‘06 to feature in the testimonial field. Following that success, Ostergaard went on to represent Birmingham, Workington, Reading and Redcar in the Premier League, and Belle Vue in the top-flight, before becoming a Panthers rider again ahead of their second-tier return in 2014. His testimonial is followed by an after-party at the New England Club in Occupation Road from 7.30pm. Entry is free upon production of a meeting ticket from earlier in the day, or £5 for those without one. Panthers were hoping to take to the track for the first time today (Thursday). They have a behind-closed-doors practice session scheduled at the Showground. The official Press & Practice Day is tomorrow with the team being unveiled at 12.30pm before putting in some laps. Ostergaard and Emil Grondal both ride in the Ben Fund Bonanza at King’s Lynn on Saturday.